Being able to write a resume is an important skill, but it can be hard to know where to start. Below are templates for writing a cover letter and a resume. All you have to do is click on the links and they will download as Word documents to your laptop. Once downloaded, simply open them up and start adding your information. The templates below were sourced from Opportune People, which is a recruitment agency focused in hospitality. On their website, they have also included other places to get cover letter/resume templates, as well as tips for job interviews, available here. Download this cover letter template here: official-cover-letter-template-opportune-people-oct-2016-1. Download this resume template here: aofficial-resume-template-opportune-people-oct-2016. What if I haven’t worked before? Academic achievements could include subjects you’ve done well in, assignments you’ve done well in, how you are as a student (well behaved, respectful, good listener etc). Leadership could include being in charge of a sports team or a group assignment at school (taking initiative, thinking strategically, being goal oriented, problem solving, organisation skills, communication skills). Teamwork could include being on a sports team, working with a group at school (participating, listening, collaborating with a group, problem solving, organisation skills, communication skills). Work experience could include work experience you have done at school, any volunteer work, if you’ve helped out with a family business. A cover letter is important to get the employer to read your resume. It is basically a summary of your skills, contact info and availability to work, so it is very helpful to attach it to your resume. You do not have to include a cover letter, however it can help give you more of a chance of being hired! You can print out your cover letter/resume and go to a workplace directly. For example, you could walk through your local mall and ask shops if they are hiring. You can also look online, there are many websites to search for jobs! Seek – you can search for you location, job type, job area and set up email notifications for any new jobs listed. Indeed – Similar to Seek, you can search for you location, job type, job area and set up email notifications for any new jobs listed. Jora – again, the same as Indeed and Seek. Facebook – you can search for jobs on Facebook by going to the search bar and writing jobs and your location. For example, in Wollongong there is a Illawarra Jobs Facebook page. Gumtree – there is a jobs section on Gumtree for you to look at. Be careful: a lot of jobs listed on Gumtree are cash-in-hand. Cash-in-hand jobs can be risky as you could be underpaid. Google search – just type in ‘jobs’ and your local area and a whole list of sites will pop up for you to check out! There are many scholarships to apply for, but where do you find them all? The easiest way to find out about scholarships is to do a google search for the degree you’re interested in. For example, if you are a woman and are interested in doing engineering, type in “engineering scholarships women australia”. As you can see, a whole list of options comes up! The Good Universities Guide is also a really handy website to look for scholarship options. Simply fill out the boxes with your information and it looks for scholarships for you! Whatever university you want to go to, also make sure to check out their websites for information on scholarships. For example, if you hoping to have a scholarship for the University of Wollongong, click here to look for your options. You may find that the university you wish to go to does not offer the scholarship you need. It is worth your time to speak to that university directly and ask what scholarships they could have available for you. If you find they still don’t offer a scholarship for you, look for other universities that may offer that scholarship. For example, on the University of Wollongong website, there isn’t a refugee option in the scholarship section. However, you could call and ask if they have equity-based scholarships, which refugee status would fit into. If not, here are some examples of other universities that have scholarships for refugees: Macquarie University, Western Sydney University College, University of Technology Sydney. Looking for scholarships outside of university? Apply the same search methods that you used for university scholarships! You can also check out this website for scholarship information for TAFE NSW. What is the EAS form for? If you want to go to university and you need some help to get there due to a long-term disadvantage, such as English language difficulty and/or financial hardship, you can apply for Educational Access Schemes (EAS). If your Year 11 and/or Year 12 studies have been badly affected by difficult circumstances and affected your ATAR score, EAS can help you gain admission to university if your ATAR is below a course cut-off. You can apply if you are an Australian citizen, a New Zealand citizen or a permanent resident of Australia (includes a holder of an Australian permanent resident humanitarian visa). You can only apply for EAS once you have applied for UAC (Universities Admissions Centre), which you can do here. You can access the EAS form here. There is also a EAS booklet that has all the information you need and a guide on how to apply, which you can access here. How do I fill out the form? 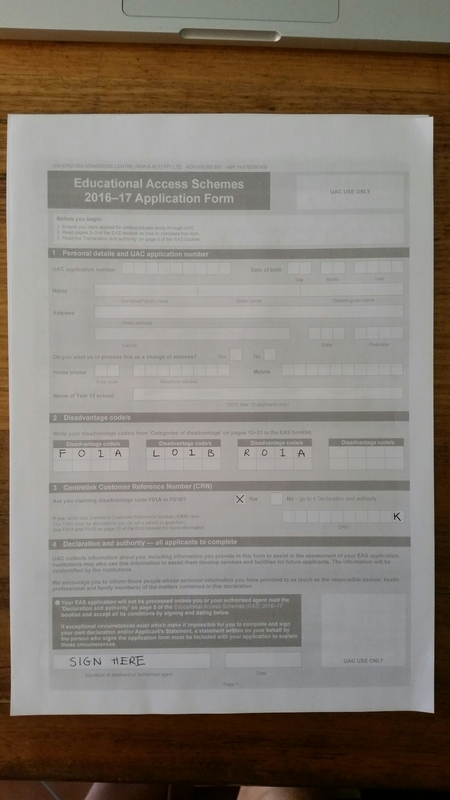 The EAS booklet is a guide on how to fill out the form. On pages 12-21 it lists the different disadvantage codes and how to apply for them. For example, if English is your second language and you started school in Australia in Year 7, 8, 9, or 10, your disadvantage code would be L01B. 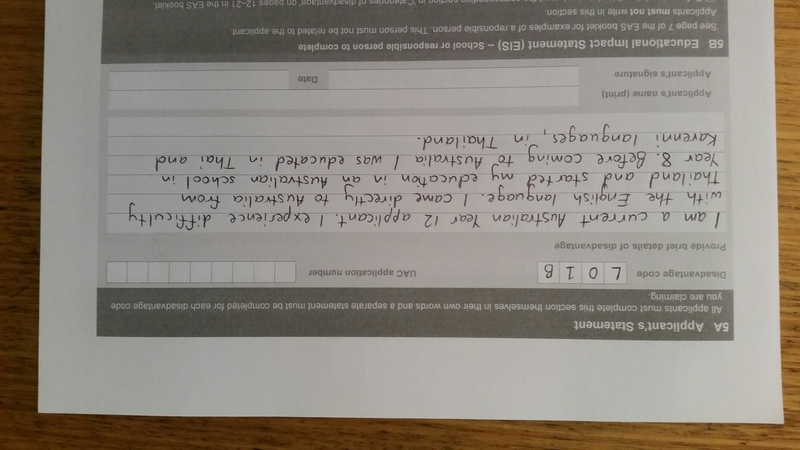 You would need to fill out a statement on the form and provide 4 pieces of documentation. I’ve provided a sample of how to fill out the form below, based on the information given in the booklet. For my example, I have completed the disadvantage codes F01A (financial hardship), L01B (English language difficulty) and R01A (Refugee status). When is the form due? You can apply for EAS until Wednesday 12 July 2017. The best time to submit your application is by 30 November 2016. Go to page 5 of the EAS booklet for key dates. Submit your EAS application and supporting documentation to UAC by post, or drop it off at UAC’s Customer Service Centre. The address is 2/6 Parkview Dr, Sydney Olympic Park NSW 2127. You will need to fill out every section on this page. For section 1, you will need to have your UAC number. For section 2, you will need to enter your disadvantage code/s. You can find information on the codes on pages 12-21 of the EAS booklet. For section 3 you need to select ‘yes’ or ‘no’ for if you are receiving Centrelink payments. If yes, enter your CRN, which is 9 numbers ending with a letter (example K). Important: Your CRN is different to your CAN. If you are unsure what your CRN is, you can log into your Centrelink account and it is on the top right corner of the page, or you can contact Centrelink . For section 4, you will need to read the information on the page, as well as page 5 of the EAS booklet before signing. Supporting documentation: as you can see from the booklet, if you are currently on Centrelink, you only need to enter your CRN on page 1, section 3. If you used to receive Centrelink payments under your name in Year 11-12 and do not receive payments anymore, you will need to attach a copy of your last payment from Centrelink. Educational Impact Statement (EIS): NOT REQUIRED FOR THIS CODE. Supporting documentation: you will need to provide 1, 2 and 4. You will also need to provide 3 if you attended an Intensive English Centre (IEC). Copy of your initial immigration visa showing the date stamp for your first arrival in Australia OR other document from the Department of Immigration and Border Protection (DIBP) on official letterhead confirming the date of your first arrival. Record of attendance (see page 7) from your current school. Educational Impact Statement (EIS): On the section underneath your statement, you will need your a person from your school or a responsible person to fill out an EIS. They must complete this section, not you. A person from your school includes your school/college principal, counsellor, year adviser or careers adviser. A responsible person includes a doctor, lawyer, accountant, social worker, counsellor, religious or community leader who is familiar with your circumstances and who can provide information regarding your disadvantage and its effect on your ability to study. The person must not be a family member or friend.